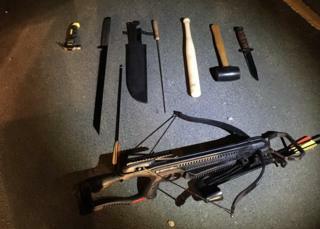 A driver has been arrested after police discovered an arsenal of weapons including a crossbow, a sword and a machete in his car. Police stopped the driver in Colchester, Essex. Inside the vehicle they also found a hammer, a mallet, a hunting knife and a baseball bat. Officers described the find as "crazy" on Twitter. Essex police have not issued any more details about the discovery or the arrest on Saturday morning.